I know I said I'd leave the BC posts to Doug, but he's up in Canadia right now so I wanted to get some BC News and Notes out of the way because of Media Day. What are we, the Philadelphia Eagles? 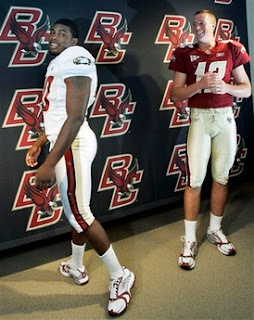 Other than that, I love the gold numbers and the maroon piping to match the helmets. 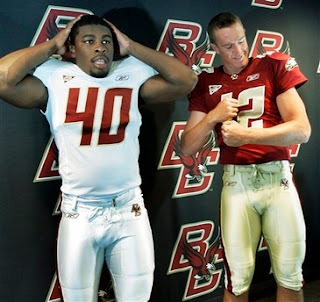 Also, check out the transcript of Jags's Q&A on BCeagles.com. The pundits can say what they want (and they have already, Pat Forde) and not give us any respect. But reading that just makes you excited about the Eagles future. For those of you who missed the Pat Forde comment, in comes in response to his story about QBs across the country. Clearly this makes me sound like a homer, but to not even acknowledge Matt Ryan in at least some capacity as the exception among ACC QBs in his sweeping reprimand of the signal callers in the conference is brutal. Sure, it isn't the best QB conference around. But Matt Ryan threw nearly 3000 on a broken foot last year in an offense that didn't play the long ball. For that to still group him with (his quote) "the top nine returning quarterbacks in the league [who] combined to throw 84 touchdown passes and 87 interceptions" is completely unfair. Ryan had 15 passing TDs (plus 4 on the ground) and 10 INTs, but that first number would have been a lot higher in an offense that actually tried. It doesn't give him justice as a statistic. I like Forde, but when he poses the question "Can anyone here play?" it makes me think he missed that BC-Clemson game two years ago or the myriad games Ryan played on a bum (or broken) foot. I'm not saying Ryan is the #1 guy in the country, although I believe he is very very good, but to be washed over is a great oversight. Doug will be back next week to take back his reins as the home team rah-rah. I'll get back to previewing some other conferences and the Heisman Race.